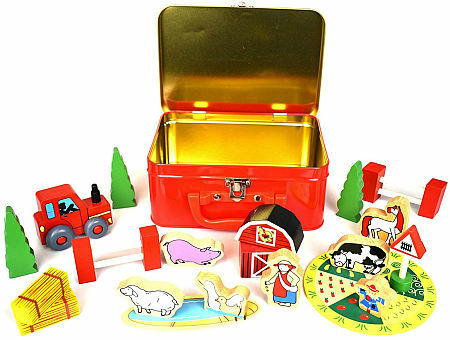 Wooden Farm Set in Tin Case is a sweet little farm themed playset beautifully presented in a take anywhere tin case. This wooden 20 piece playset comes with a tractor, 3 trees, 2 fences, 5 animals, farmer, barn, scarecrow, crops, pond, 2 hay bales, and a road sign. Material: Wood childsafe paint, tin. We like this because: "Lots to do and see. A whole farm in a tin case... brilliant. "